Welcome to Natural Parents Network’s Handmade Holidays! We asked readers for tutorials, pattern, recipes and more and they came through! Our readers have shared some fantastic posts which we will be sharing with you in four post: Meal Time Gatherings, Gifts for Babies and Children, Gifts for Adults, and Food Treats and Gifts. We hope you will enjoy these posts and find some inspiration yourself. At the end of each post you will find a linky to add your own posts on the various topics. You can add tutorials, patterns, and recipes, but you can also just link to posts which show off your own creativity. So dive in, check out the great links, and inspire one another to go handmade this year! We all love treats and these are all favorites! Whether you are making treats to eat as a family, take to a get together, or give as a gift, these fantastic recipes will have you churning out gourmet treats like a pro! 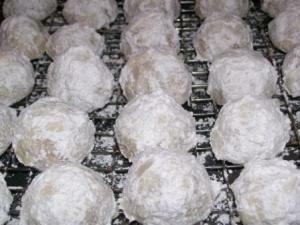 Abbie at Farmer’s Daughter shares the recipe for her favorite Christmas treat: Snowball Cookies! Also called Mexican wedding cookies, these little bite sized confections appeal to the young and young at heart. These Nut Flour Cookies from Amy at Anktangle are a perfect treat for sharing with guests and loved ones during the holiday season. Not only are the very delicious, they are gluten free and high in protein. Share them at a party or send them home with friends and family. Keep some handy for your own family to help from being tempted by less healthy treats. 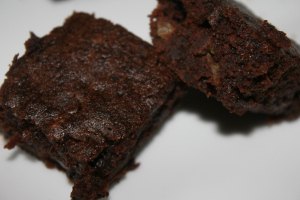 Black Bean Brownies are Mandy’s go-to gathering treat at Living Peacefully with Children. 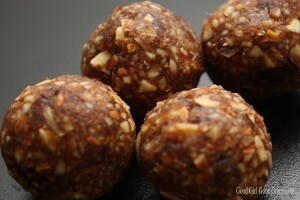 Not only are they dairy, gluten, soy, and corn free, they are chock full of protein! It’s a delicious way to eat your beans without any bean flavor. 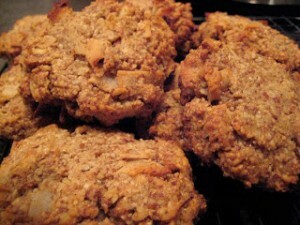 Charise at I Thought I Knew Mama shares beautiful and healthy holiday treat recipes from Good Girl Gone Green. These Date Boat and Nut and Seed Ball Recipes are simple to make for your hungry hoards. Simple in style but complex in flavor, make some of these tasty treats ahead of time. 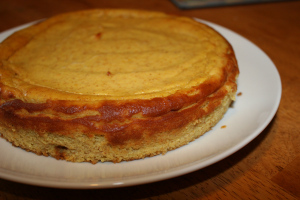 This Clementine Cake from Mandy at Living Peacefully with Children is perfect for any Solstice gatherings. Round and yellow like the sun, it’s custard like texture is accentuated with a light sweetness and is gluten, dairy, soy, and corn free! 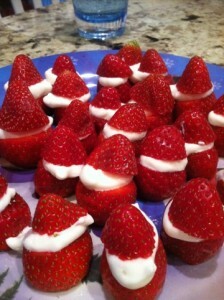 Abbie at Farmer’s Daughter shares an easy, healthy Christmas recipe for Santa Berries. Fun for kids, these strawberries will add color to your buffet without adding artificial sugar. These make great breakfasts, appetizers, or desserts! While there, check out the links to other great holiday treats. Handmade canned goods are always a favorite gift to receive. 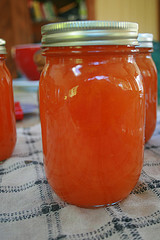 Shannon at Food and Laughter shares her favorite recipe for Apricot Vanilla Jam, also referred to as Canned Sunshine! As we enter the darkest time of the year, give a little sunshine to someone in your life. 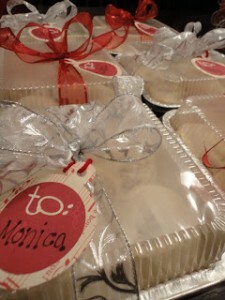 If you need an easy and affordable holiday gift, homemade cinnamon rolls in pretty wrapping fits the bill. Hannah at Young and Crafty shows how she dresses up some easy baked good for a wonderful presentation. Sam at Hobo Mama offers a slightly sweet, stove-popped Cracker Jack alternative that would make a delicious holiday treat. 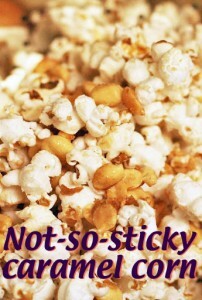 This Not-So-Sticky Caramel Corn is vegan, dairy, and gluten free! Make some to share on those cold winter nights. 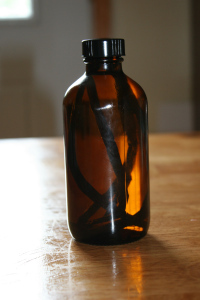 Homemade Vanilla Extract is a popular gift, both with those making it and those receiving it, as evidenced by the three posts we received about it! That Mama Gretchen shares some economical and cute ways to package your homemade vanilla. Annemarie at Real Food Real Deals breaks down the economics of it with this price comparison. While Mandy at Living Peacefully with Children shows pictures of the process. However you look at it, making homemade vanilla is an appreciated gift and an easy one to make with kids. Don’t throw out those beans! Check out each of the posts for different ideas on how to reuse your vanilla beans. 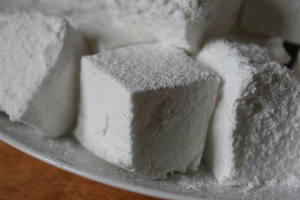 These Homemade Marshmallows from Living Peacefully with Children are easy and inexpensive to make, free of high fructose corn syrup, and have enough gourmet appeal that your guests or gift recipients will be exclaiming over your awesomeness. Package with some hot cocoa mix and you have a great gift! Or use them for a quiet fun-filled evening at home with your family. Consider taking a healthy treat to the neighbors. 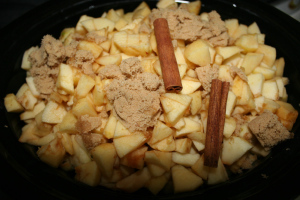 The mouth watering Slow Cooker Cinnamon Applesauce from Living Peacefully with Children. Let the slow cooker do the work of making it while your home fills up with a wonderful aroma. Place in a jar and head over with your gift. Link up your own tutorials, patterns, and recipes for homemade holiday food treats!